We are located on the Island of Maui in Hawaii but can travel to all of the Hawaiian Islands to search for you. There will be a service charge of $100.00 to show up...this covers my travel expenses...In regards to finding your lost ring...I work on a reward basis... that means you pay me what it's worth to you and what you can afford for me to find your ring. Maui Metal Detecting is a full service metal detecting recovery business that will search for lost rings or lost jewelry anywhere on the Island of Maui. Maui Metal Detecting specializes in searching in waterfall pools, sandy beaches, in ocean surf, and under the water to a depth of sixty (60) feet. Maui has specific conditions that make using most standard metal detectors difficult which can often lead to less than desirable search and recover results. Maui Metal Detecting has invested over $30,000 in equipment specifically designed for metal detecting in the harsh coastal conditions we find here on Maui. Maui Metal Detecting also has a zodiac boat to transport us and our gear to those remote snorkel or dive spots where you may have lost your ring. Maui Metal Detecting like some of it's competitors owns a Snuba device which is simply an air compressor floating in a tube with air hoses that hang down in the water so air can be supplied to a diver attempting to metal detect. These snuba devises work well in calm waters but in the surf and in rougher waters these devices can flip over and should this happen the machine will ingest salt water which will immediately and dangerously cut off the divers air supply and require hundreds of dollars in repairs. Maui Metal Detecting owns what we feel is the very top of the line snuba equipment but we have only been able to safely use the device twice. Maui Metal Detecting has found that scuba diving works best on Maui for chest deep or deeper underwater recover as it allows us to operate safely in rougher waters. When contacting a metal detecting specialist here on Maui you may want clarify if they will search in water deeper than six feet and if they state they will, you may want to ask in what conditions will they actually search. Please view our website and read our testimonials and see where one woman found out personally how experience and equipment makes the difference when she lost her $23,000 wedding ring. She had solicited a metal detector specialist to locate her ring but when he was unable to find her ring Mac was requested to also search the exact same area and within twenty minutes Mac was able to recover and return the ring to her. Mac is a US Marine Corps Veteran, a retired police officer and the founder of Maui Metal Detecting. 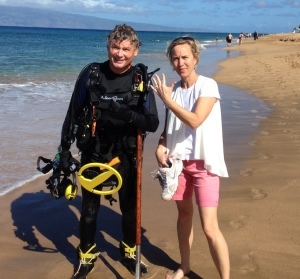 Maui Metal Detecting was formed on the inspiration of a retired US Naval Officer on the Island of Oahu who has spent the last forty years of his life finding and returning lost wedding rings to their rightful owners. After purchasing his first metal detector Mac read the instructions and headed to the beach. As it turns out Mac was a natural in and out of the water and within only two hours of metal detecting Mac was approached by a woman that had lost her wedding ring in the sand. Within about twenty minutes Mac had found the ring and after seeing the look of happiness in the woman’s eyes, Mac was hooked. Experience has now shown Mac that his first find was simply pure luck and that it is only through training, vast experience and the utilization of top of the line equipment that the art of metal detecting can be perfected. Since finding that first ring Mac has received specialized training from renowned salt water surf metal detector enthusiast and designer Dale Rohif. In addition Mac has received specialized training in water currents, tides and sand movement from a renowned University of Hawaii Professor of Oceanic Studies. Mac has been a certified scuba diver for over twenty years and unlike most metal detector specialist in Hawaii who will only search in the water to about waist deep, Mac will search under the water to a depth of 60 feet. Simply put, if you lost your ring in eight feet of water, you need someone that will search in eight feet of water.